Listed on the National Register of Historic Places, Rosemary Hall is now a bed and breakfast that aspires to pamper its guests in a peaceful atmosphere of elegance and romance. 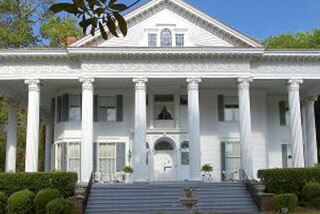 Relax on the sweeping veranda of this North Augusta Bed and Breakfast boasting 12 stately columns. Soak up the sun as you sink into a cozy Pawleys Island hammock made for two, in beautiful North Augusta. Impressive decorative architecture, lavish woodwork, original oil paintings, and bronze statues combine to simultaneously enchant and comfort the visitor both inside and outside the home.